High quality data is very important. From running comps to conducting fair transactions, clean data is vital. Our Data Integrity group is tasked with clearing over 20,000 potential data errors a year. They’re also here to help. To reach Data Integrity, call 480-921-7777 or email: DI@ARMLS.com. This is the core rules document approved and adopted by the ARMLS® Board of Directors. It contains photo/media, status, lockbox access, definitions and other main rules. The policy addresses the use of language in the remarks and other fields for security, to reduce unwarranted legal liability and deter unfair competition / compensation among subscribers. This policy defines non-penalty violations, penalty violations, lockbox violations, fines and processes. Remember, the first penalty violation fine found against a subscriber each calendar year is waived. There are other policies that apply in certain circumstances. For example, the Short Sale policy gives a Q&A for listing agents listing a short sale. The DOM policy states how we calculate Days on Market. The IDX policy applies to subscribers and vendors who have an IDX website. The Content Access Policy applies to anyone with a data license to ARMLS data while the Subscriber Agreement applies to all subscribers. THINK YOU KNOW THE RULES? TAKE OUR QUIZ. Below you’ll find nine questions regarding the Rules & Regulation and Inappropriate Language Policy. A perfect score will demonstrate your knowledge of the rules. After the quiz below, find out how well you know the photo rules. How well do you know the ARMLS Rules & Regulations? 100%?! 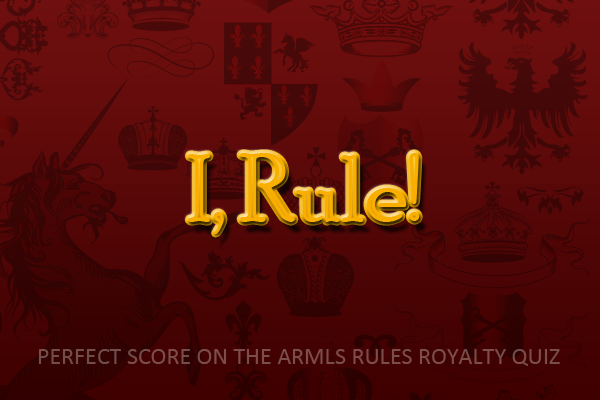 You are an ARMLS Rules Master! Some might even say you’re royalty! The Rules can be found here: Rules & Regulation and Inappropriate Language Policy. On Craigslist, may you post a listing from outside your office without permission of the Listing Subscriber? A Listing shall not be advertised by any Subscriber, other than the Listing Subscriber/Subscriber, in any medium whatsoever, without prior consent of the Listing Subscriber. After a Residential For Sale listing closes, how many photos must remain? We recommend that no photos are removed when a listing closes, Rule 8.24 states that one must remain. Unless specifically directed otherwise in writing by the seller, each property FWA in Property Class 1 (Residential For Sale) and 2 (Residential Rental) must have a minimum of one photo of the exterior of the property attached to the Listing and submitted by the Listing Subscriber or Subscriber’s contractor. This exterior photo is defined as the street view of the front elevation of the dwelling which incorporates a substantial portion of the entire dwelling. For apartment style or loft properties this exterior photo must represent the exterior of the building in which the unit is located. This exterior photo must be attached to the Listing within four (4) Days of the Listing being FWA. This exterior photo must remain with the Listing ARMLS Rules & Regulations Page 21 throughout its life regardless of any status changes and may not be removed by the Listing Subscriber or Subscribers contractors under any circumstances. This main exterior photo does not have to be the primary photo attached to the listing unless it is the sole photo attached to the listing. A Lockbox must be removed from the property within ______________ days after the date that the Listing status is changed to sold. 13.5. TIMELY REMOVAL OF LOCKBOX. A Lockbox must be removed from the property within two (2) Days after the date that the Listing status is changed to sold, leased, cancelled, or expired. Title Company Language. Any statement requiring the use of a specific title company is prohibited from inclusion anywhere on the listing (e.g. Must use XYZ Title). This includes all fields and all attachments. You may, however, put a statement that suggests or recommends the use of a title company in the Private or Semi-Private Remarks and/or private attachments. Examples of acceptable title company language: 1. Please use Jane Doe at XYZ Title 2. Will receive a discount if XYZ Title is used 3. Must close at XYZ Title, but may purchase title insurance elsewhere. How long does the Listing Agent have to upload a photo (for listings that require a photo)? Which property class or classes require a photo? When a Lockbox key is assigned to a Subscriber or Affiliate, that key is for the Subscriber’s or Affiliate’s own use. A Subscriber or Affiliate is not permitted to allow any other person to use his/her assigned key, nor shall a Subscriber or Affiliate use another Subscriber’s or Affiliate’s key. In addition, the personal identification number that is required to operate the key is not to be disclosed to any other person and is not to be written on the key or written on any paper or document that is stored with or near the key. Furthermore, a Lockbox Key may only be used to the extent of its assigned privilege authorized by the Subscriber’s or Affiliate’s Association. When is open house information allowed in the Public Remarks field? Any item besides contact information that may lead someone to bypass their own contracted agent to directly seek out the listing agent are not allowed in the Public Remarks, Directions Public Supplemental or Public Attachments. This includes but is not limited to: Open house information and Auction dates. You may disclose in the Public Remarks that it is going to be auctioned, but you may only include the date, if you are so inclined, in the Private or Semi-Private Remarks. This also must be included in the Auction fields. True or False? Gates Codes can be in public, private or semi-private remarks. c. Any items that may cause a safety issue. This includes but is not limited to: Gate codes, lockbox information, and references to the occupants of the property or the hours they are in the home. None of those items or others that may cause a safety issue is allowed in any of the public fields. Additionally, see Section 3 for further important information about property and community access codes. 3. Access codes for a property or community may only be entered into the specific access field for which they are intended. The three access code fields are named Gate Code, Alarm Code and Mech-Box Code. No access codes for a property or community may be displayed in any other field.